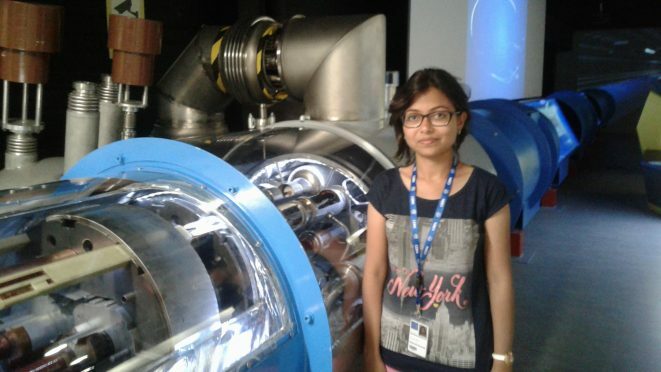 About the Author: Renata Saha, a student of National Institute of Technology, Durgapur, shares her struggle of bagging an international internship and how she finally managed to intern at CERN along with starting her own company. This story starts from the time when my internship experience during summer 2016 was published on the Internshala Blog. I had planned to apply for foreign internship programs in the next summer. After all, I wanted another of my internship experience to be published on the Internshala blog! Jokes apart, I started registering on common international internship portals such as DAAD (Germany), Mitacs (Canada), and EPFL (Switzerland). While Mitacs had a single portal where all documents had to be uploaded and, most importantly, everyone with a CGPA above 8 could apply, to be eligible to apply for DAAD, one required an invitation letter from a professor at a German university. Needless to say, application for DAAD was more of a tedious, time-taking, and pain-staking process. Thus started the DAAD Chapter of my life. I listed all the universities and the names of professors considering my area of interest and started emailing. The process of emailing is not easy and one should make sure that the emails shouldn’t be copy-pasted; every email should be specific for the concerned professor, keeping in mind the working domains of the laboratories. Also, I had to calculate their time w.r.t Indian Standard time such that my email reached the professors just when they entered the labs in the morning. Scheduling all the emails at that time and then checking the inbox continuously, hoping for a mail to pop up – the worst part was awaiting the replies. I finally got a positive reply from the director of the computer science department of Karlsruhe Institute of Technology (KIT). I further emailed him regarding the necessary documents that I required from their side to be eligible to apply for DAAD scholarship. Thus started another phase – DAAD Application! Collecting all the documents, arranging for the Letter of Recommendation, persuading my professors to sign the NOC – I completed all the tasks and sent a hard copy by courier. And then started another long wait. Every morning I woke up and got down to work thinking that I would be in Germany the following summer. I even started learning German. As mentioned in my last year’s story, I was judged as the runner-up in a nationwide innovation challenge conducted by Tata Centre for Technology and Design (TCTD), IIT Bombay. There I had designed a multipurpose health parameter monitoring chair with e-diagnostic features along with online doctor consultation fitted inside a medical booth, with or without the mobile feature. Although it was just a mere idea then, my senior, Sayan, found true potential in it and had correctly estimated that it was a million dollar idea. Our estimation was put to reality when with this idea, in its early prototyping phase, we were rated “Promising” in Digital Impact Square(an entrepreneurial platform conducted by the joint initiative of MIT Media Lab & TCS), selected amongst the top 20 social entrepreneurs of Tata Social Enterprise Challenge 2016 (an initiative of IIM Calcutta), won the social track of Eureka 2016 (Asia’s largest business model competition conducted by E-Cell, IIT Bombay), and bagged second position in the social Track of Empresario 2017 (business model competition conducted by E-Cell, IIT Kharagpur). After receiving such a great response, we decided to start our own company. Hence, at the age of 20, I became the CTO & co-founder of a start-up named Wecare Medservice LLP. Though I thought about dropping out of college and concentrating solely on my startup, it wasn’t possible as my family wanted me to finish my graduation. Thus, I resumed applying to different internship programs. On a chilly December night, I finally received an email from DAAD – I was rejected for the scholarship. I was shattered when I realised that it was completely a CGPA-based selection procedure and one’s resume or accolades apparently didn’t matter much. For the past 6 months, DAAD had been the only thing on my mind. In one night, a single email snatched everything from me. I blamed myself for not studying in my first undergraduate year, or else my not-so-bad-CGPA would have been better. Nothing I did could replace the shock of the mail. When rejections from Mitacs, EPFL, and Indian Academy of Science followed, my mind was perturbed; however, the entrepreneurial spirit within me arose. Inspired by Naveen’s pitch in TVF Pitchers, I refused to give up. I started the phase 2 of my internship application. My college offers an opportunity to four students from multidisciplinary fields to do a research internship at European Organization for Nuclear Research (CERN), Geneva, Switzerland. At first, 30 students are selected according to their CGPA. Then they are called for a personal interview by 4 professors of our Institute. Having a decent CGPA, I was selected for the interview. We were called in groups of 5 for the interview. I was asked what I wanted to do at CERN and what my strengths and weaknesses were. I talked about the research I aimed to do at CERN mapping my previous project at Jadavpur University. I told entrepreneurship as my strength, and that’s when the interview took a different turn and a series of questions followed like – difference between an entrepreneur and an engineer, difference between an engineer and a physicist, characteristics of an entrepreneur, etc. As I was speaking from my experience and real-life learnings, I gave the answers confidently and could see that the interviewers were convinced. After 5 days, the results were out. I was selected as a summer intern at CERN, funded by the Government of India. At last, my summer 2017 was sorted! As it’s said, when the time is bad, do not worry; instead, keep trying. Good times will strike and that time the success will only be yours. Within 15 days of my selection at CERN, I was also selected for internships at IISc Bangalore and a couple of laboratories in France, funded by the professors themselves! Although those offers were captivating, the offer from CERN was something I could not reject. I had three other students who were also selected for their internship at CERN from India accompanying me. CERN internship came with a lot of in-built motivating packages. The most interesting of all was crossing the Swiss-French border daily! My apartment was in France, but I had to go to work in Switzerland, and sometimes I even travelled between the two countries on foot. My head supervisor was Dr. Archana Sharma, the first permanent Indian scientist at CERN. CERN has several experiments running together such as CMS, ALICE, LHC-b, ATLAS etc. Archana Ma’am would work at CMS, but I was appointed to ALICE experiment in the GEM lab under the supervision of two physicists: Chilo Garabatros, the project leader, and Robert Helmut Munzer. My research interest on the generation of time-efficient and cost-effective algorithm and its FPGA implementation mapped with the GEM lab. They had collected test data from the upgraded ALICE Time Projection Chamber (ALICE – TPC). However, the magnanimous amount of test data was in an unreadable format and couldn’t be analysed. I was responsible for programming that data into a readable format and was also involved in the analysis of the same using object-oriented data-analysis software, CERN-ROOT. Apart from data analysis at the laboratory, I was the face of communication for Indian Summer Students 2017 with Dr. Archana Sharma. From coordinating underground group visits to the LHC to contacting the authorities in case of any trouble my fellow summer students faced, I managed it all. The work culture at CERN is simply amazing. No one pressurizes you about the work and everyone understands the importance of deadlines. Everyone is eager to help you whenever you need them. For instance, I remember, I could not install the CERN-ROOT software on my PC. I happened to email the professor named Rene Brune, the creator of the software, for about 29 times in a single day to help me fix the software. And he patiently replied me each time clearing my queries and waited until the bug was fixed! My work was successfully completed ahead of time and report was submitted when I was taken for an underground visit to the place where the actual particle detectors are located. All particle detectors are actually different points of a pipe named Large Hadron Collider (LHC) which is 127 km in circumference, running 100 meters underneath the surface of the earth, stretching across the two countries- France and Switzerland. I happened to visit the part of the LHC named “CMS Point-5”. We were taken 100 meters below the surface of the earth in a lift and given a tour around the detector and the supercomputers. Like every other individual, I had visualized what happens at CERN from the Dan Brown’s celebrated novel and movie, Angels & Demons. I never thought that I would get to visit the same place in reality and see the LHC with my own eyes. That 5-hour visit to the LHC was truly once in a lifetime experience! Even at CERN, in my leisure time, I worked for my startup – as they say, once an entrepreneur, always an entrepreneur! From preparing Excel sheets of the expenditure of our company to establishing contacts with people who worked in the same area, I managed everything. And, of course, I did find some time to travel in Europe. I visited Paris, Amsterdam, and Vienna. I joined my cousins from the US over a weekend when they came for a vacation at Vienna. Needless to say, I had a gala time there. This internship gave me a lot of new friends from all over India and abroad, helped me work with some of the best minds of the world, and created a series of memories which I am going to cherish for the rest of my life. The two-month internship ended, and I was back in Kolkata. The very next day I was in my startup, being updated on all the action that I had missed. The transition between an entrepreneur and a researcher – this conflict has become constant in my life. But, if given another chance, I would really want to relive my CERN days. Are you also bitten by the science bug? Apply to these cool science internships and take the next step towards a career in research. I am an engineering student. If possible, could I get Ms Renata Saha’s email address. I would like to contact her for some information. Thank you. I’m afraid we cannot give away the personal details of a student. You may try contacting her via LinkedIn or Facebook.